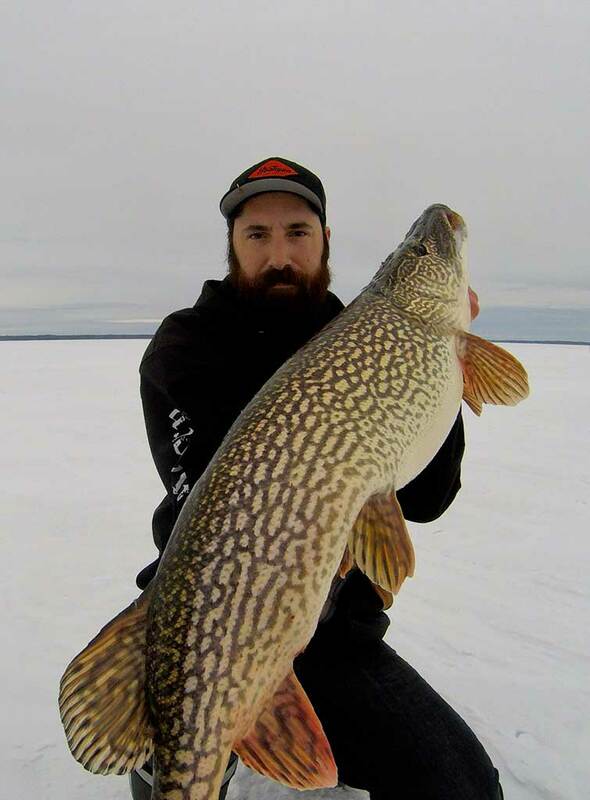 Fishing Pike on the frozen tundra in search of "the big one." 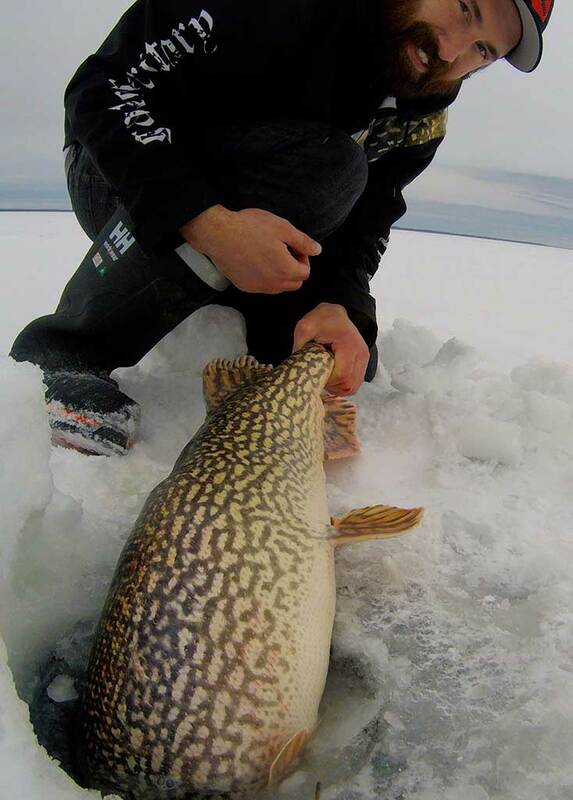 Punching holes on the frozen tundra in search of "the big one." As the new year was quickly approaching with only a few days left to get out fishing I wanted to get some content to finish off another great year of fishing. 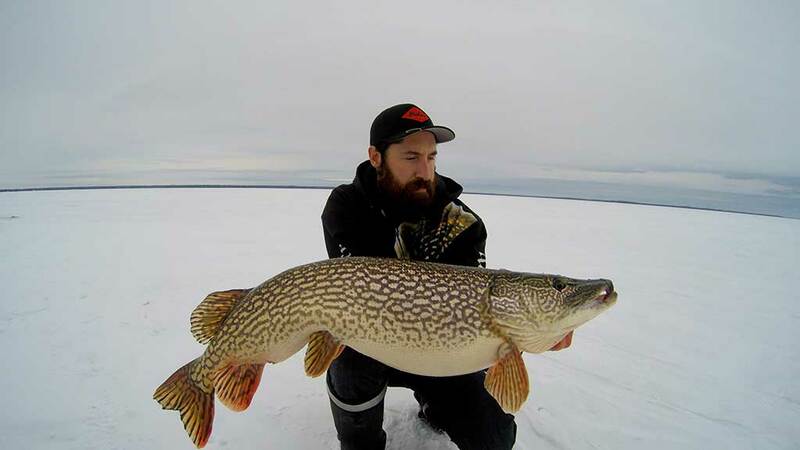 Northern Pike were on my mind but with holidays and family around it was hard to go anywhere far, Me and a friend of mine jumped through a few loop holes and managed to sneak away for a day. I had my eye on the weather a few days before watching it for snow, wind or cold temperatures but it was suppose to be fairly mild all in all. It was a very early morning as we had to switch vehicles with another family member a couple hours away then head to the lake we were fishing, we left my house at roughly 3:30 a.m. and didn't get to the lake we fished until just before 7 a.m. but we managed to beat day break and got set up in the dark. The weather was not as good as expected with temperatures in the mid 20's, strong winds and light snow on and off throughout the day. Before the sun even came out we started catching perch, they were few and far between each bite but we pulled in a few to keep us busy until we could warm up from setting up and until the sun came out. As soon as the sun peaked out the pike started coming in to feed, the perch would scatter so we'd drop down a big bait/lure and most times would land the pike. They were all fairly small being under the 30 inch mark. As the day went on fishing slowed down with less of both species coming in. I had tried a BaitCloud at a different lake a few weeks back with negative results and the company sent me out a few more packs to test out, so we got bored of course and started joking around about these BaitCloud balls and joking became serious so we tossed down one of their predatory balls to hopefully bring in some perch as I thought they might work better for them instead of pike. This ball I through down was red in colour and it fizzed longer then expected this time, it was down for about 5 minutes when something caught my eye off to the side in my hole while I was sitting there jigging for perch, this was a bigger pike for sure! I could see the width on her clearly, she came in very slowly and floated directly through the BaitCloud bubbles staring blankly at my small lure. She had no interest in it whatsoever and turned toward my friends hole and swam slowly past his small lure as well until she disappeared under the ice. We both quickly scrambled and through down big lures in hopes to get her attention but she didn't return. A few more minutes went by and all of the sudden I heard the bell on my tip up go off, which happened to be in the direction this fish had left our shack, I scrambled to my feet and ran outside. I picked up my tip up and put it aside, I could see the line was pulling out slowly but I didn't want to set the hook until I knew she had it in her mouth well, I gave it a few seconds and then pulled hard and I could feel the weight of the fish. She ran a couple times but nothing crazy and came in more like a log. At this point I didn't think it was a very big fish and definitely didn't put two and two together that the big one that had just went through our shack had went that way. It wasn't a long fight and I had the Pike head turned into the hole, now if anyone knows when you see a bigger pike come through a 10 inch hole and all you see is open mouth, this is what it looked like and of course you know you have beast! We pulled her up and brought her into the shack immediately as the cold air would freeze her instantly. I tried to do a live video of the measuring for all my Facebook followers but the service wasn't great and it didn't work out. We measured the girth first and it came in just just above 22 inches so I figured probably a mid 40 inch Pike for length I was looking at. "it wasn't a long fight considering the size of the fish"
We laid her on the fat boy bump board I received from The Musky Factory and she filled it width wise but to my surprise came in at 40 1/2 inches. I then quickly took a few quick pictures outside and returned her back down the hole. This fish right here had made our trip worth the time all in a matter of minutes! So as I had mentioned earlier we put down a BaitCloud, am I totally convinced that's what brought this fish in? It could be a possibility, I do catch fish this size without them but she also did swim right through the bubbles possibly curious of the scent or site of it. I do believe you have to be fishing in a good fishery regardless and really if the fish aren't there to begin with, don't get your hopes up or waste too much money thinking these baitClouds will magically bring you a fish. 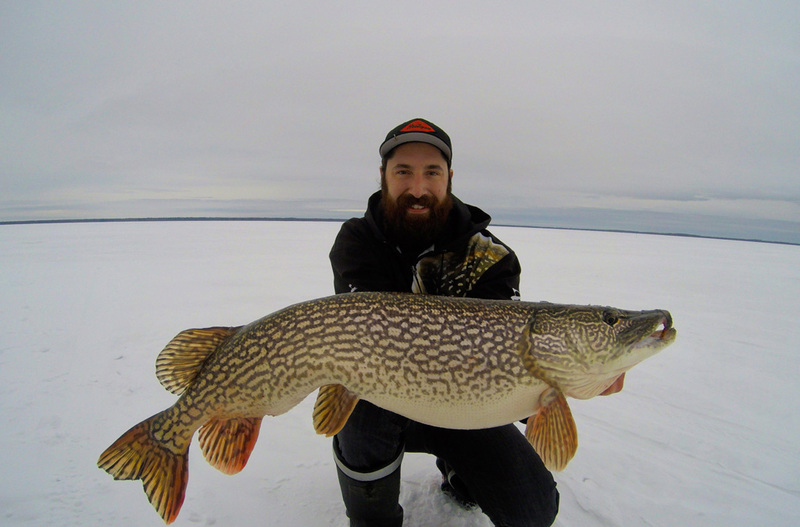 Anyways after this fish was released we landed and lost a few more smaller fish and ended up packing things in early because it became windy to the point that it was almost ripping my ice screws right out of the ice and I didn't want to have to chase my tent across the lake. All in all a very productive but long day and one big fish landed, so we headed for our long drive home with sore backs as we're not used to looking down a hole all day yet this year. It is now 2017 and I'm super excited to see where this year will go with a few new companies sponsoring me and lots of new products to test out from them, let's hope we see as many big fish as the past few years. Follow Andy's adventures, download Wild Society App now, it's free!